Mrs. Brosseau's Binder: Make Your Classroom Cuter! A Quick Way to Perk Up Your Bulletin Boards! Make Your Classroom Cuter! 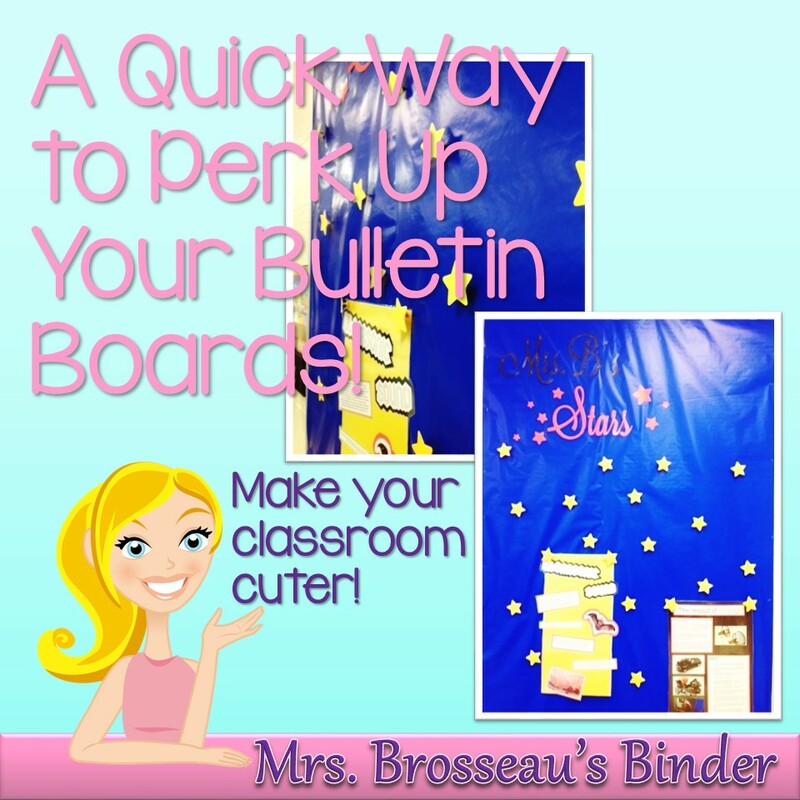 A Quick Way to Perk Up Your Bulletin Boards! As I mentioned before, as soon as I found out about getting a room to myself for my 3 classes I started decorating right away. The first stop is the Dollarama store to get wrapping paper to cover the bland corkboards. I knew I wanted one that looks like the night sky to display student work. I tried covering the dark blue wrapping paper with blue cellophane but it didn't quite look right. So I needed a different way to add interest. The previous teacher in this room left lots of push pins so I was going to use those instead of staples to display student work (in hopes that this would also get me to change up the board more often). Here is a quick way to make your class cuter: affix shapes onto your push pins! All I used was star shapes cut out from cardstock on my Silhouette Cameo, Recollections permanent glue tape and pushpins. Just roll the permanent glue tape onto the center of the back of the shape. Press the pushpin firmly for a few seconds. Insert the pushpin into the corkboard; you don't have to wait. I wasn't sure if the paper would hold, but they've been up now for a few days with no signs of coming loose. Cuter than basic pushpins and also gives a nice three dimensional touch to the bulletin board. Just be careful when you pull them out! How can you adapt this for your classroom theme? -There is lots of cute clip-art on the Silhouette Studio store. Whichever theme you are going with this year I'm sure there is something for you. And if not, check out my post on Cutting any shape with the Silhouette Cameo. -Use pre-cut shapes from educational stores or the teacher supply section of Staples. -Type out encouraging words or phrases like "Wow!" or "Great work!". -If you are going with a superhero theme type out fun words like "POW" onto colorful paper. -Type out student names or print out pictures and match the work you're displaying to the pushpin. Do you have any other ideas? Let me know in the comments below. Love the 3-D effect! Great idea! You gave me a reason to use the Great work! and Excellent! cut outs I found at Dollar Tree but didn't know what to do with..now I will just have to find them! Your board looks awesome! I hope you have a great first week back, and it's a short one too!